Standing alongside a bus displaying the image of Alfie and the important message that ‘Legal is not Safe for Legal Highs’, the group spoke about the success of the campaign so far and why they are supporting this initiative to work together to raise awareness of the dangers of these substances. Alfie Mawson said: “I am supporting the campaign to raise awareness of the dangers of legal highs to young people. It is important that everybody understands that legal is not safe and that these substances could potentially be more dangerous that illegal drugs. 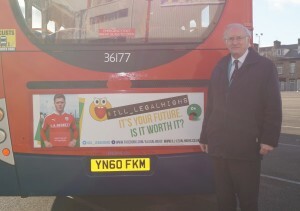 The #ill_legalhighs campaign was launched in early October on social media accounts Twitter and Facebook. 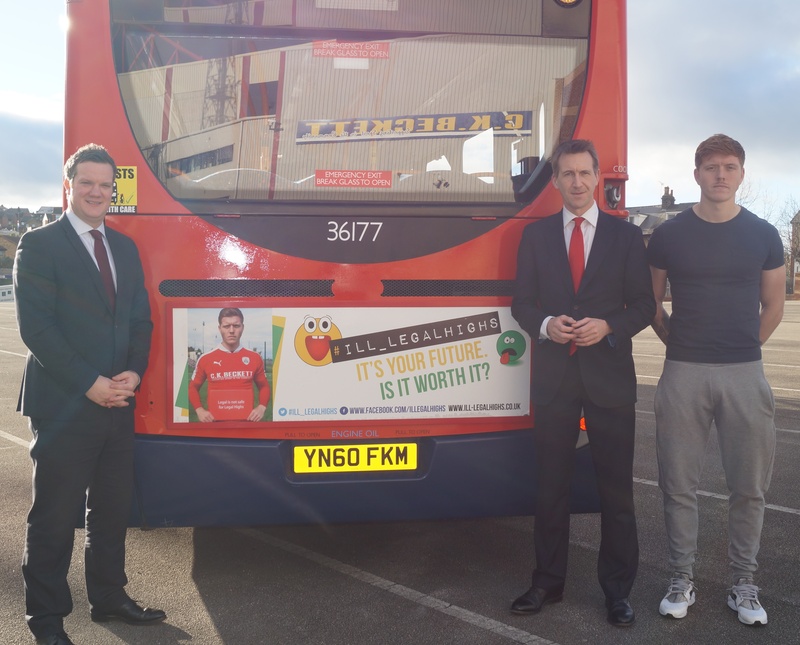 It uses images of popular South Yorkshire football club players such as Barnsley Football Club’s Alfie Mawson, Sam Winnall and Conor Hourihane to raise the awareness of the dangers of taking legal highs. The images are tweeted out through Barnsley Football Club, Rotherham United, Doncaster Rovers, Sheffield United, Sheffield Wednesday, Sheffield Steelers, Doncaster Belles and former Referee Howard Webb’s Twitter accounts and reached over 2.4 million accounts in the first week. Dr Alan Billings said: “I first of all have to thank Barnsley Football Club and each of the clubs that have supported this campaign. We could never have reached the audience we have in such a short space of time without their help and support. “Young people and their parents look up to these footballers such as Alfie who have worked hard to gain successful careers. By working with us they have helped get a very important safety message out to the residents of South Yorkshire. Dan Jarvis MP said: “I have spoken to many people in Barnsley who have seen the harmful effects of so-called ‘legal highs’. In town we have had people fitting, vomiting and collapsing after taking these substances. There has been at least one death locally linked with taking them – and many more across the country. “I have been campaigning, both locally and nationally, to outlaw them. Many people think that, because they are currently legal, they are therefore safe. But this isn’t the case and I will keep campaigning until we have rid our town of this blight”.